New York Painting Services, a full service painting contractor, is fully licensed and insured to provide professional services and expertise to the commercial and residential properties of New York and New Jersey. With our commitment to prioritizing our valued clientele, we insist on friendly customer service, high moral standards, traditional values, along with superior craftsmanship on all services we offer on a consistent basis. New York Painting Services artisans are among the elite; having been masterfully trained, gaining experience in the industry, and with remarkable skills, they are more than qualified to perform any task associated with our services. 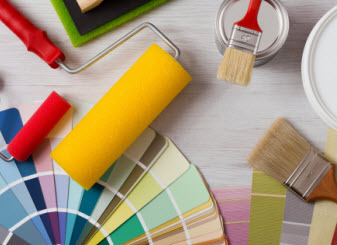 In addition to having phenomenal professionals in our arsenal, New York Painting Services only uses high-end products, materials, and equipment to deliver maximum results. New York Painting Services includes modern interior design and painting consulting and application to the commercial businesses and residential homes throughout the Greater New York and New Jersey area. A common misconception is that contemporary design and modern design are one in the same. That is not the case. Modern refers to the period of time, which was the design style created in the 1920’s-1950; remaining unchanged as a defined style forever. On the flip side, contemporary design is ever changing. Modern interior design is referenced to the “Mid Century modern”. The primary distinction is the clean, unadorned interiors with the use of natural materials like wood, leather, teak are the distinguishable characteristics. As far as modern furniture is concerned, molded plywood and plastics along with polished metals are dominant. It is very open and raised from the floor to allow the eye to absorb additional space and let the air move more freely. To expand the space, a popular use of color is white, used often with bare floors paired with neutral colored wool area rugs. Though modern and contemporary is similar, there are also some differences that truly separate the two styles. 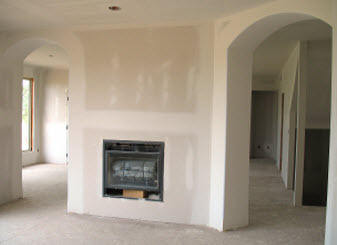 Below you will find some of the basics concerning modern interior design and painting. Modern Interior Design Style: Clutter is not permitted; open rooms, clean lines, and streamlined furnishings are the essence of the Modern design style. Commonplace in modern designing is the wide-open rooms and design shapes of simple curves, angles and lines. Accessories are kept to a minimum; with the “less is more” strategy and furniture is sparse, with only practical function of each piece being available. Modern Colors Palette: As mentioned previously, white is the predominate color followed by black as a close second. 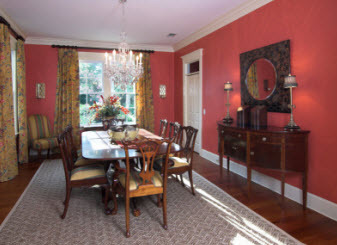 Used subtly, the primary colors; red, yellow, blue add pops of brightness. Modern Furniture & Furnishings: Chrome or stainless steel is commonly used to construct the metal furniture use in Modern designed homes. Black or white lacquer finishes and glass table tops along with solid or tone-on-tone color patterned upholstery. Modern Walls: In modern interior design, the walls are plain white, an essential element in modern styles; however, to break the white-only theme and the sterile-like environment one wall can be painted in a color, usually in neutral tones. Modern Flooring Ideas: As mentioned before, bare floors are a part of modern design with concrete, linoleum and granite being the common flooring options as well as plain wood floors. Carpeting also works with solid neutral coloring. To break up the plainness of the flooring, a few area rugs in single colors or geometric patterns, however, less is more, don’t over used the area rugs and avoid oriental styles or anything that looks too soft and frilly. Modern Window Coverings: Skip the window treatments if possible. If covering the windows is necessary to protect the surroundings from direct sunlight, go with plain curtain panels or blinds; do not use anything fancy, frilly, or patterned of any kind. If you have any questions, or are looking to design your home in the modern style, contact New York Painting Services and let our design experts consult with on the possibilities.